If you are looking for classy style, plenty of seating and cargo space, and fuel efficiency that allows you to go wherever it is you want to go, then the Volkswagen Up is a vehicle you will want to pay close attention to! Its spacious design fits 4 with cargo space in the back and thanks to its 5 door design, accessing any part of the car is quick and easy. It comes standard with airbags and ABS, is highly fuel efficient and is a great vehicle for any use- whether that is driving around town, going sightseeing, attending meetings, or anything else you need to get done. 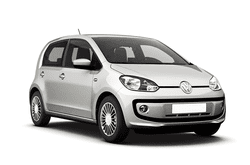 If you need a vehicle that is both practical and attractive hen you should consider the Volkswagen Up for your next car rental!